June knows how important it is to get everything just right to give your home the designer touch and flair. She is passionate about bespoke curtains, blinds, soft furnishings and using traditional methods. June supplies tracks, poles and sundries as well as fitting, hanging and dressing your treatments by her professional fitter. She has a selection of fabric books for you to browse and also offers a re-upholstery service. No obligation* quotations can take place in the comfort of your own home where we can discuss your requirements and ideas. *Please note we only offer a free consultation on your initial visit, thereafter a consultation fee will be charged at £75, which will be refunded to you upon placing an order with us. Call June to discuss your project! Hi, I’m Judith; let me tell you about my family business…the original Scottish Shutter Company - Experts in Window Shutters, Plantation Shutters, Wooden Shutters and Shutter Blinds. When it comes to specialist knowledge, The Scottish Shutter Company has over 30 Years’ experience in coming up with beautiful, creative solutions for your most challenging of window dilemmas. We have showrooms in Broughty Ferry, open Monday to Friday 10-5pm and in Edinburgh (Ratcliffe Terrace), open Monday & Saturday 11-3pm and 11-6/7pm(Thursday) for the remainder of the week We’re Scotland’s largest, independent, family-run, shutter company, and very proud of our long heritage in the window shading business. We supply and install interior timber plantation window shutters, as well as other specialist window shading products including motorised radio-controlled blinds, throughout the whole of Scotland, Cumbria and Northumberland for both domestic and commercial clients. We have accumulated considerable technical expertise in dealing with unusual sized or shaped windows, such as arches, port-holes, and gable-end windows as well as the more familiar bay, bow, dormer, tilt-and-turn and sash-and-case windows. So, if you’re looking for window shutters or other specialist window coverings, we’d love to hear from you. Our friendly, family approach is what our clients tell us made the difference for them. Catherine Lepreux Interiors helps clients in Edinburgh, Fife and throughout Scotland make the most of their homes; from interior design help to hand-sewn curtains, blinds and soft furnishings. Coming home at the end of each day should be an uplifting experience. We aim to help you to make your home a more beautiful, personal and comfortable place to live. Our initial, no obligation, consultation is free of charge. Harvey Bruce Blinds, Shutters & Interiors are a family run business with over 40 years experience within the home furnishings industry. We aim to creatively inspire your interior. Harvey Bruce are a family run business with over 40 years experience in the interiors sector. We guarantee three things - fantastic service, great quality products at an affordable £ Our aim is to supply the best quality products we can with an unrivalled service and back up that ensures customer satisfaction. We only supply top quality products manufactured through iso9000 processes and adhering to new european child safety legislation. Our product range is one that has been sourced by scouting europe's top suppliers and selecting the very best quality products that are of great value. We also operate a right price/first time policy so you will not be offered products at inflated prices or any crazy mega deals - simply the right price first time. We specialise in Basswood plantation shutters and also supply a full range of window blinds from all major suppliers. Our new soft furnishing / interior design centre has just opened and we can offer a full interior design service. INES Interiors was established in 2015. Originally from Germany, Ines left the family home interiors business in Berlin to move with her family to Edinburgh. Ines has worked at James Erskine Interiors in Morningside for 9 years covering all aspects of window dressing and floorings before setting up her own business again. She always enjoyed working with the client to find the perfect individual solution to improve how their home feels. This can be a small thing like the perfect paint shade, to stunning curtains, practical blinds or the right flooring solution. So why not contact us for a free no obligation home consultation for your next project? We fit premium quality wood shutters which are all made to measure and engineered to the highest quality standards. We fit for all types of properties and all types of windows and doors including conservatories and sunrooms. Bespoke soft-furnishings of the highest quality. We're a local business that specialises in creating bespoke soft furnishings and interiors; from made to measure curtains and blinds to upholstery and interior decoration. We also supply and fit a wide range of curtain poles, tracks and curtain accessories. No project is too small for our professional team. We’re proud to say our made to measure curtains, blinds and soft furnishings are all handmade in Scotland, in our East Lothian workshop. Keeping business local is important to us. Local supplier and installer of hight quality Plantation Shutters and window blinds. Forth Blinds, based in Pestonpans, near Edinburgh, began trading early in 2015 following a serious factory fire which forced Sunrite Blinds Ltd into Administration. The partners of Forth Blinds, Colin Mercer and Philip O'Brien, who both worked at Sunrite, have 35 years combined experience measuring and fitting quality blinds. There is no shape, size or style of window we haven't tackled over the years! Forth Blinds supply to schools, hospitals, offices, shops, care homes, government departments, student accommodation, historic buildings, houses, flats and conservatories. We always go that extra mile and get a buzz when faced with difficult and awkward projects that other companies walk away from! We'll never give false promises regarding timescales and completion deadlines either! From us, you can expect FREE helpful advice, no high pressure selling and a full 5 YEAR NO QUIBBLE GUARANTEE on most products. www.dekoria.co.uk is a unique one stop shop for all home textiles, fabrics by the metre and accessories, from made to measure curtains and blinds to Ikea sofa covers and tea towels. We pride ourselves on offering a unrivaled range of home decor accessories that can be coordinated to create a timeless smart interior or mixed & matched for a funky and relaxed look. We offer excellent quality and customisation at highly competitive prices. Select a Blind has been established since 1982 and is a family owned and operated business. We operate from premises at Swanston Steadings next to Swanston Golf Club. We have achieved an enviable reputation for providing a quality product at a competitive price, backed up by an excellent customer service. Blinds are provided on a made to measure basis using all leading manufacturers. We can supply and fit the most technologically advanced systems including electrically operated and motor driven blinds. A full curtain making service is provided offering a very wide range of fabrics and we only use Silent Gliss head rails. We are a bespoke interiors business. We've been going for over 30 years although we've only recently decided to join the digital age. We offer a range of services from gifts in stock to wallpaper orders to a full design service. Curtains, blinds and all soft furnishings are our mainstay, we stock most of the well known fabric designers, including Voyage, Moon and Harlequin, and are passionate about fabric. Curtain makers, retailers and designers in Edinburgh, City of Edinburgh can work wonders with pieces of fabric, while fitting blinds or shutters can be tricky to do yourself, so it’s definitely a wise idea to hire a window dressing professional in Edinburgh, City of Edinburgh who can design, make and/or fit bespoke blinds, curtains or shutters for you. 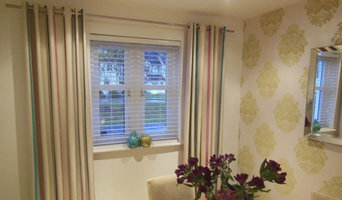 Whether you want sleek roller blinds for your home office, roman blinds for your kitchen, venetian blinds to smarten up your living room, plantation shutters for your bay windows or delicate voile curtains for the bedroom, there will be Edinburgh, City of Edinburgh curtain makers, blind fitters or shutter company to help you with your ideas on Houzz. A curtains, blinds or shutters company in Edinburgh, City of Edinburgh will first be able to advise you on the style of window dressing that will work with your windows and rooms. If you have an idea or design in mind for your window dressing, then discuss this with any potential experts, such as curtain makers in Edinburgh, City of Edinburgh, to see if your design and style is possible. You will need to work closely with them if you are planning on having custom curtains, bespoke blinds or shutters created. Curtain makers will be able to turn most fabrics into curtains, so if you’ve found a pattern or fabric you like already, present this to your Edinburgh, City of Edinburgh curtain makers and they could be able to turn it into curtains for you. Even when clients don’t have certain fabrics in mind, curtain makers can suggest fabrics based on your style and the rest of the room’s design. They can pick out the right weight, thickness, length and pattern that would suit your room. Curtain retailers in Edinburgh, City of Edinburgh will offer a huge range of readymade curtains, or curtains that can be adjusted or made to order. Contact Edinburgh, City of Edinburgh curtain retailers if you’d prefer to choose from a large selection of ready-to-go curtains; whether they are high-end designer curtains or just plain white curtains; rather than waiting for some bespoke designs from a curtain maker that may take a bit longer. You may find that curtain makers in Edinburgh, City of Edinburgh also offer a stock of ready-to-go curtains, too, but always double check with the professional first. Once you’ve decided on a design, curtain makers, blind fitters and shutter professionals will usually measure your windows or doors to ensure a good fit. If you are having blinds or shutters made then it will probably be best to have them professionally installed, too. Blind fitters and shutter companies should offer this service with their products as blinds and shutters need to be firmly fixed to the windows; something that most homeowners don't know how to do themselves. Although roller blinds and Roman blinds can be fairly simple, vertical blinds and Venetian blinds can be a bit more complex, and if you want remote controlled blinds that operate with the touch of the button, then you definitely need to call in the Edinburgh, City of Edinburgh blind fitters. Plantation shutters are substantial window dressings and need careful measurements and installation, so it’s really best to leave the measuring, design, manufacture and installation to a professional Edinburgh, City of Edinburgh shutter company. Blind fitters, shutter companies and curtain makers in Edinburgh, City of Edinburgh should also check the insulation of your chosen window dressing and make sure there are no potential hazards once fitted. Finally, they should confirm with you that your curtains, blinds or shutters are functioning as you’d like them to before finishing the job. What should I ask Edinburgh, City of Edinburgh curtain makers, blind fitters and shutter professionals? Find curtain makers, blind fitters and shutter professionals on Houzz. Narrow your search in the Professionals section of the website to Edinburgh, City of Edinburgh blind, shutter or curtain maker professionals. You can also look through photos to find examples of Edinburgh, City of Edinburgh window dressings that you like, then contact the curtain retailers, blind fitters, shutter professionals or curtain makers in Edinburgh, City of Edinburgh who worked on them.